If you don’t have a wedding planner, get yourself a wedding planner! That is, an organizer like the one above. Step 1: Buy a planner with an area for notes, a to-do list, and a calendar to dedicate SOLELY to wedding planning. Step 2: In the notes section, put all of your ideas… what flowers you want, your colors, dress ideas. Step 3: On your to-do list, list everything you still have to do before the big day. Step 4: Mark important meetings, deadlines, and other days on your calendar. Step 5: Go through bridal magazines and begin ripping out pages that give you ideas or that include discounts. Stick them in your planner. Step 6: Start collecting coupons for bridal shops and wedding vendors and put them in your planner as well. (Check out our previous article: 8 Little Known Ways to Get Wedding Discounts). Step 7: Keep up with it! 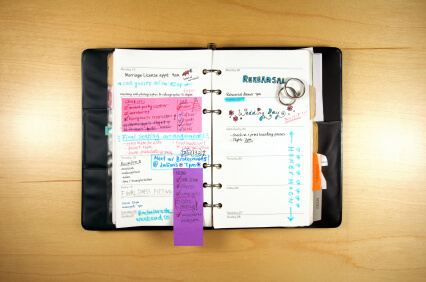 Make sure to look at your calendar everyday and cross items off your to-do list as you complete them.